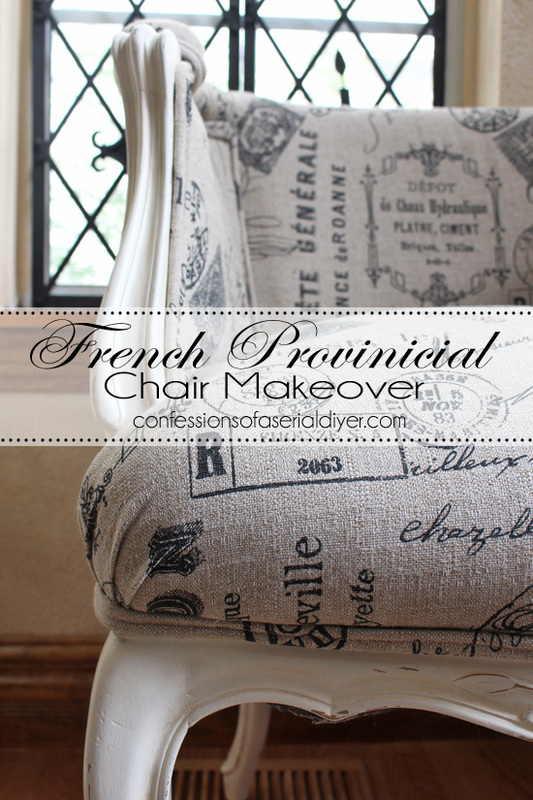 Today I am so excited to share my French Provincial Chair makeover with you! I’m excited mostly because they are done! As you can see by the preview photo, this story has a happy ending. But it wasn’t without a few bumps (and blisters) in the road. My Mom and I spied these chairs at an estate sale last Friday. We passed on them, knowing they required a lot of work, but she had a change of heart and went back for them on Saturday. Luckily everything was 50% 0ff and she scored these two beauties for $55 for the pair! However, they did not work in the space she was envisioning them in, and she dropped them off to me the next day. 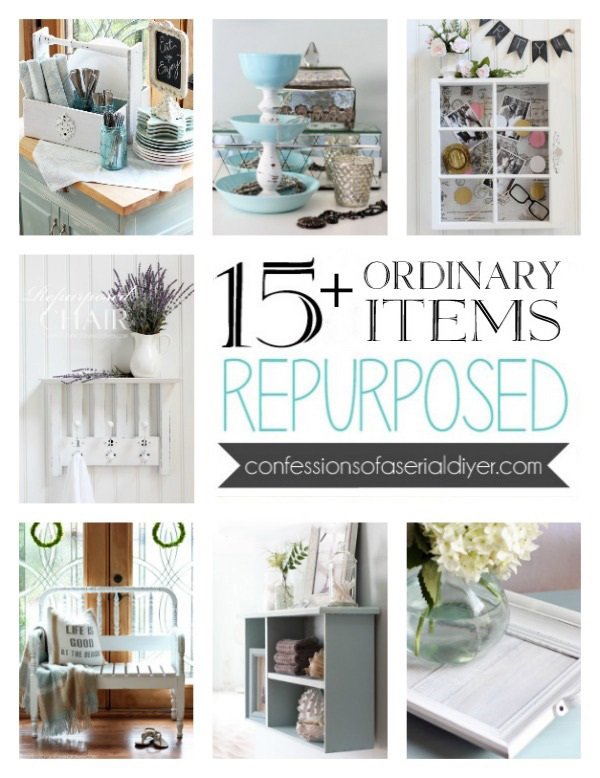 I knew I just had to use these as my project for our Furniture Revivals theme for this month’s Get Your DIY On party, but I seriously underestimated the amount of time it would take to redo them. I was unable to remove the smeared paint without messing up the finish, so I painted out the frames. This is the same fabric I used on my Desk Chair and the Dresser I redid with fabric inlay on the drawers. It is perfect because while it still has a neutral feel, the color and pattern hide a multitude. It has held up extremely well on my desk chair. It is a heavier weight decorator fabric I found at Hancock Fabrics. It normally retails for $29.99 a yard, but I was lucky to find it at 50% off and had a 20% off the total purchase coupon. I think I used about a yard and a half for each chair. I am so in love with these chairs. I have been guarding them like crazy from my claw-happy cat and Cheetos-fingered four-year old. This was no easy undertaking. I thought (actually I wasn’t thinking at all) that I could just cover over the existing upholstery. Easy as pie. I got right to it painting out the frame before I got started on the fabric part. Perfect…except um…there is no way to cover over the side panels that are attached to the inside frame. Ugh. So I pulled, yanked, cursed, tugged, cursed at a gazillion staples that were holding this thing together. I was done…with one chair. Are you kidding, I have another whole chair to go?? I couldn’t be satisfied with one chair for my big reveal, Oh No that wasn’t good enough. I MUST have two chairs. It was kind of fun to see it all come back together. I even made my own double welt cording to save money. 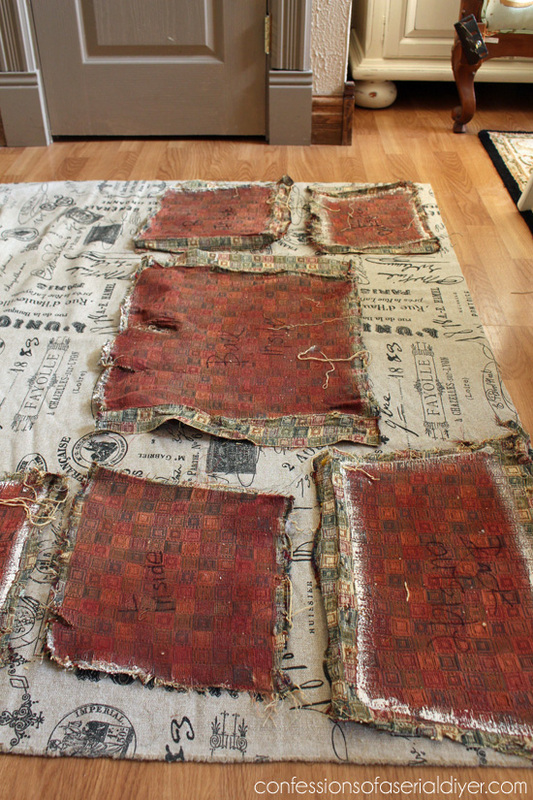 Take photos of each step as you remove the old upholstery to reference when it’s time to reupholster. Use these pieces as pattern pieces for your new upholstery. If you see how everything comes apart, as long as you have lots of photos to refer back to, you should be able to piece it back together. I used the same foam and batting since it was in decent shape (and free). I’m sure I saved a lot by making my own double welt cording, but there are a trims you can purchase too if you prefer that look and don’t want to bother with sewing your own. Fifteen hours later, I was done. Marathon upholstery I tell ya! But I am SO thrilled with the results! 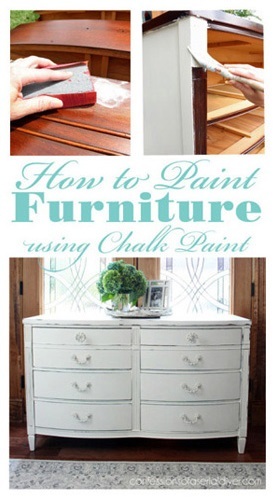 I used my DIY chalk paint left over from the Desk I just completed with French graphics. I sanded a bit and waxed with Annie Sloan’s clear soft wax, followed by a very light amount of dark wax. You almost can’t even see it in the photos, but you can in real life. 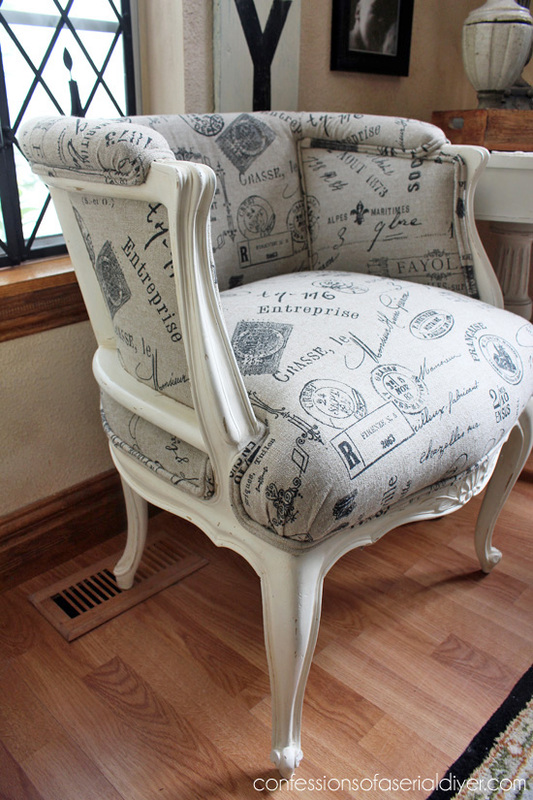 To see more of the how-to for these chairs, click here. To see my tutorial for double welting, click here. The fun starts this Sunday, November 2nd at 7:00pm EST. 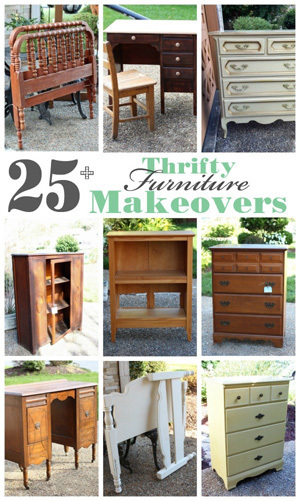 Come link up any furniture makeover project or just come by to get inspired! I will not be reupholstering anything anytime soon, I can promise you that! I need to at least lose the permanent staple gun grip from my right hand first. 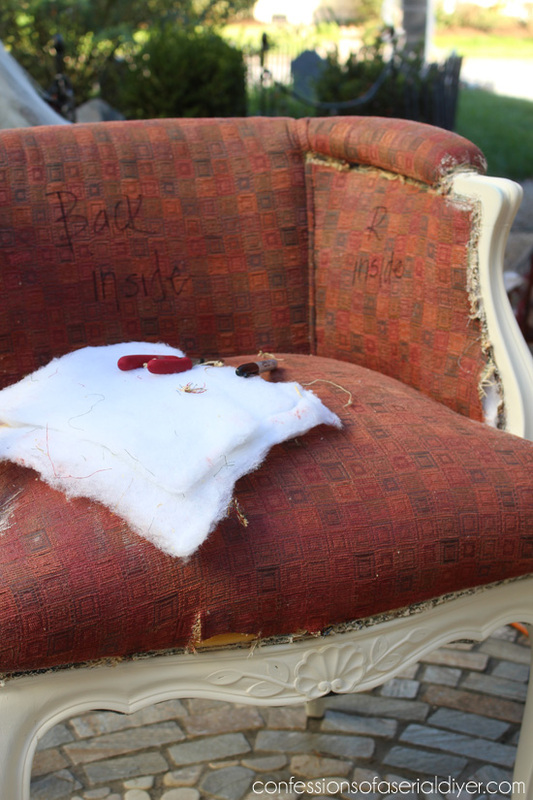 Have you ever reupholstered anything? Did it go well? Christy, wow….wow….WOW! What talent and vision you have….and probably a backache! LOVE the chairs so, so much! I think you appreciate a piece more when your blood, sweat and tears go in to it, don’t you?? Love the final vignette you created with them. Truly love it all! You’ve made my morning bright! These turned out wonderfully. You have some talent! Thank you for sharing. Wow! These so impressive! They turned out fabulous. You have inspired me to give this a try (maybe)! You are brave to undertake this project and do it in such a short amount of time. I would love to see the photos of the entire process. Wow, what a marvelous job you did. As professional-looking as any pro could do. And the cording is perfect. This was a monumental undertaking and my hat is off to you. (I only wish you could keep them, perhaps in a closed off bedroom!) Vicki in Louisville KY.
WOW Christy, what a great job!!! They are beautiful. Don’t know how you do it!!! Absolutely gorgeous. Wish I was closer, I would buy those in a split second. You amaze me with your talent, ingenuity, and vision. 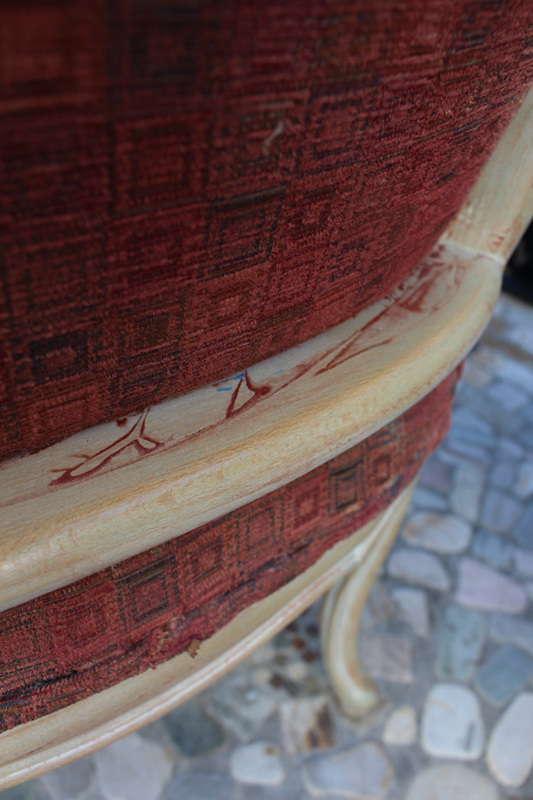 Who would have ever thought the ugly chairs you restored could look like they do. Keep up the good work. I have chairs like that and would love to see the step-by-step, including what tools you used. Beautiful job! 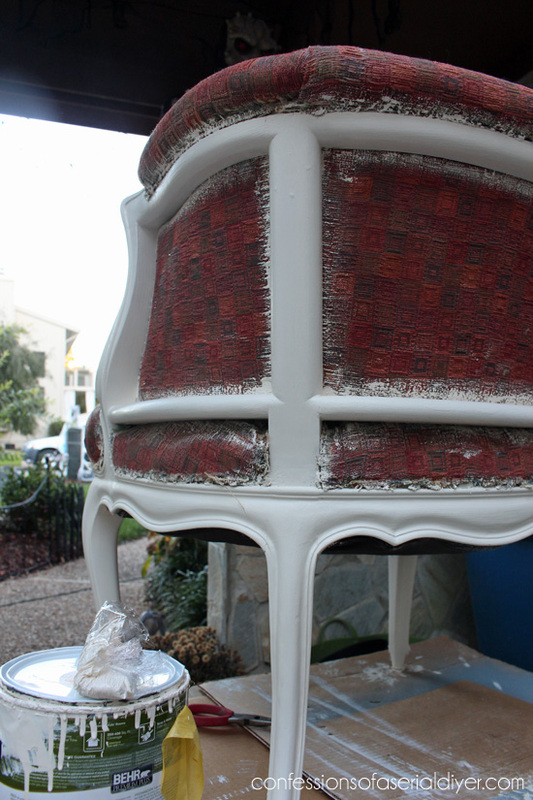 Christy, once again, you have inspired me to get back to work…this time on a half finished Louis XV chair, found years ago in a thrift shop…the poor thing still needs A LOT of work, but I think NOW I am ready to tackle it! Would love to see your step by step! WOW!!!!!!!!!!!!!! Please post the tutorial. I know a lot of people would appreciate it. Christy! Those chairs turned out fabulous!! All of your blood, sweat and tears paid off. I thought they were for your Mom but I hope you got a good dollar for them at your booth!! Was it difficult to make the double welting and did you glue it on? Again, wonderful job!! The chairs are absolutely georgious!! I would love to see the whole process. I have a old swivel vanity chair, compleat with pink silk fabric, horse hair seat cushion, and a foul smell of cat urine. I removed ever thing down to the frame. It’s still sitting in my garage, because I don’t know where to start. Again beautiful work!! Oh yes, step by step photos and instructions, please! I am eying my own upholstery project and I’d love to be able to reference your technique! I love doing projects like, seeing a piece from the thrift store given new life. As I approach retirement, I’m thinking about renting a booth and selling them. How do you decide your asking price? The other questions is about the pedestal table in the pic. I have one but the top is lopsided and I’ve been trying to think of an idea for re-creating it. Do you have any suggestions? Oh my goodness! You did an amazing job! 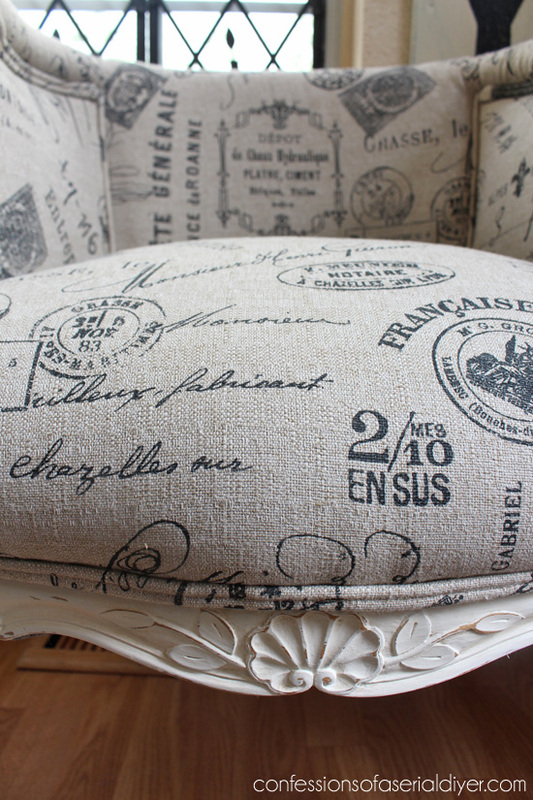 I wish I could upholster! My garage would be full of many more projects if I could! Wow Wow Love these chairs. You Rock Girl. They are beautiful. How can you sell them!! They look so awesome in the corner of your dining room. One of the best re loves of chairs I have ever seen. Gorgeous. Holy Christy, you finished both of these in fifteen hours! Impressed the heck out of me. What a score at $55.00 for both. 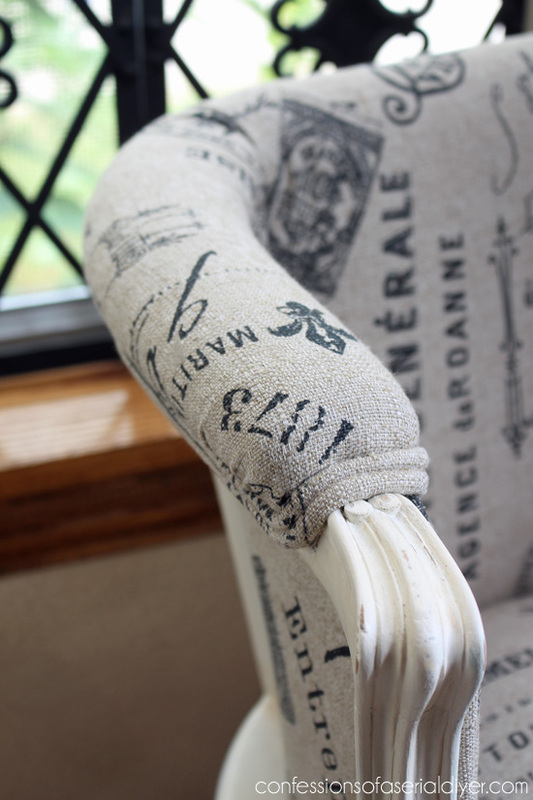 Love love love that fabric, these chairs are stunning! They look so good in your dining room, I bet it’s going to be hard to part with them. If I lived nearby I’d be buying them from you in a heart beat. Beautiful professional looking upholstery job Christy. Do you have a piping foot on your sewing machine to make the double welting? 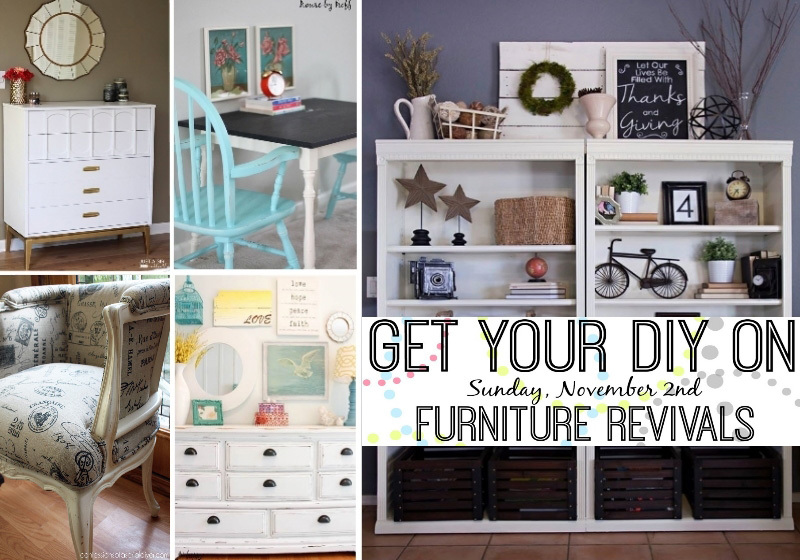 Christy I’m featuring your gorgeous chairs this weekend at the DIY Sunday Showcase party. Hope you have a great weekend! Christy….all that comes to mind is WOW!!!! I love what you did and all your hard work surly show how talented and great at what you do! LOVE them! Your chairs are awesome!! Thanks for offering to share the entire process of the makeover. I would love to see it! I really enjoy your blog..it’s my fav!!! FABULOUS! I would get the cat declawed (I always do for my inside cats) and keep the 4 year old away from the chairs! You have to keep them they are so beautiful! I have to get me some of that fabric but the closest Hancock is 3 hours away! 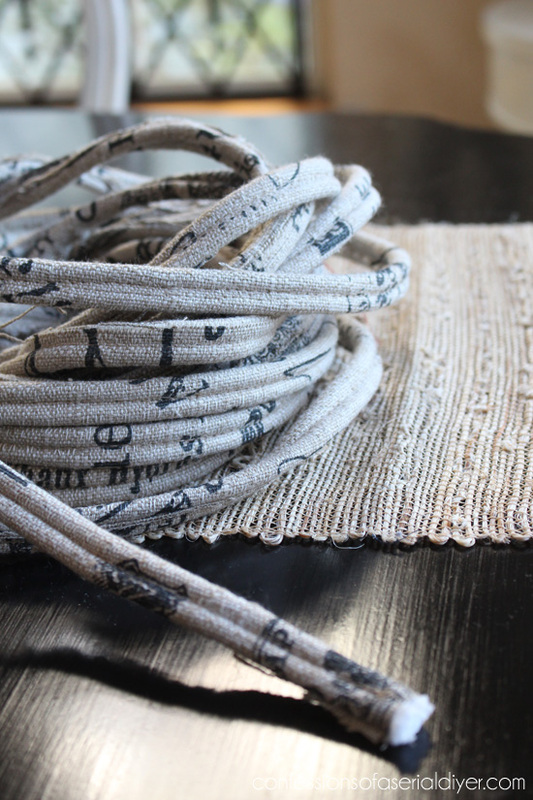 Making double welting is easy and yours looks great! HOLY POO!!!!!!! These are amazing!! I’d be cutting the fingers and claws off the kid and cat and keeping these for my own dang self. 😛 You did an incredible job. They’re gorgeous!!! SPECTACULAR JOB Christy! Wow! You are talented and patient! As for the Cheeto’d 4 yr. old, you could Scotchgard the fabric. Not sure what to do about a clawwed cat; I have a big drooly dog, so I use a LOT of Mr. Clean Magic Sponges. 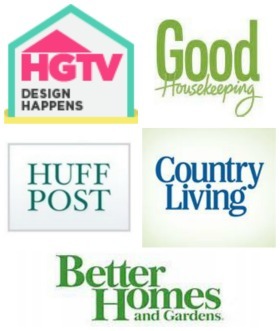 I have been following your blog for awhile and love your taste and projects. Enjoy. OMG-those chairs are gorgeous!!! I would love to get the entire tutorial. Don’t know if I could ever do as good a job as you did but I’d sure like to try. Love the double welting ! Just beautiful, I would buy them both if I were close. Oh Christy! These chairs were worth every single minute of hard work that you put into them! I’ve never really considered re-upholstering furniture before as it’s always seemed like an impossible feat to me, but these GORGEOUS chairs are SO inspiring!!! If you’re sharing tutorials of the entire process, I’d love to see one too! I’m pretty sure these are my most favorite chairs ever! AMAZING job girl!!! Ii would love step by step instructions, especially on how to make the welting. I have two chairs I need/want to recover. 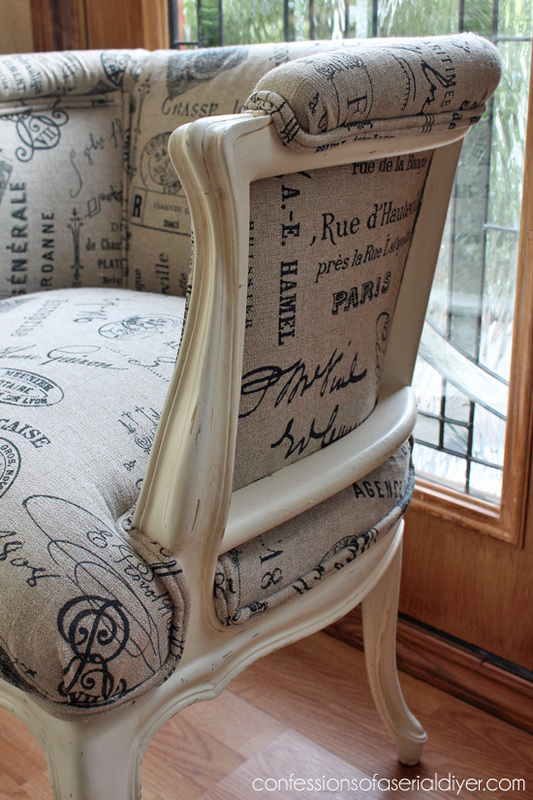 What an awesome looking pair of French chairs. I love them. Words cannot describe how beautiful these chairs came out. Love them with the table and lamp. WONDERFUL job. And I do mean job. Would you do it again? Or was it too hard? Thanks so much, Robin! Yes, it definitely was a job for sure. I might do it again in the future, but I would definitely allot myself more time next time! They are absolutely beautiful! GREAT job! And… I would like to see a tutorial, please! Thanks for offering. These are fantastic. I’d love to see the entire process – Thanks for sharing ! Upholstering a whole chair is something I’ve never been brave enough to take on. Yours look amazing and so pretty in your little vignette in the corner! WOW!!!! You are the master!!!! I humbly bow down to you!!!! GREAT JOB!!!!! a flop…just so we know you are human!!!! Wow! Wow! Wow! I love them, you are so blessed to have such talent! The chairs are so beautiful! I didn’t understand what you were referring to early on when you said they had been painted, When you showed your cutting layout I understood. Who would do that? I’d like to see a post about making welt. I’m sure the chairs will turn a tidy profit, good for you. 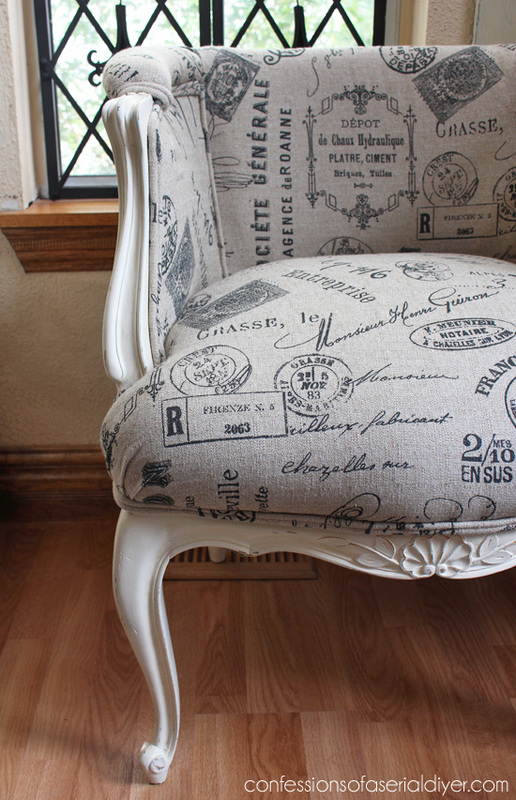 I love the chairs because I love anything french provencial. Could you please include me in on the upholstery step by step how to. And the welts also. I have never done upholstery. How did you know what piece to take off first? where did you get that material? lastly, i love that lamp, did you do it too? Have a blessed new year. I am so glad i follow you. I just i had been the one who purchased those chairs. Guess i gotta make my own. lol, Can’t wait! Christy . . . . I must say you are very brave and extremely talented. I’m so pleased you are so willing to share the step-by-step instructions, photos, and “serious” language we may need to use, knowing it will help complete my project. I’m ready Girl! Thanks in advance. Oh my. WHAT. A. TRANSFORMATION. I can see why it just about killed you. They are absolute stunners now though, Christy. Amazing!! Thanks so much, Krista! They were a lot of work, but they turned out so pretty. I’m glad my Mom went back for them. I passed them right by! LOL, how cute are you??? haha love it …and wow, they were a lot of work but they look it!!! GORGEOUS! What a fabulous job. Those chairs make my heart sing! I just need one part of your courage! Congrats! You did a great job. I want to let you know I feel in LOVE with your dresser. 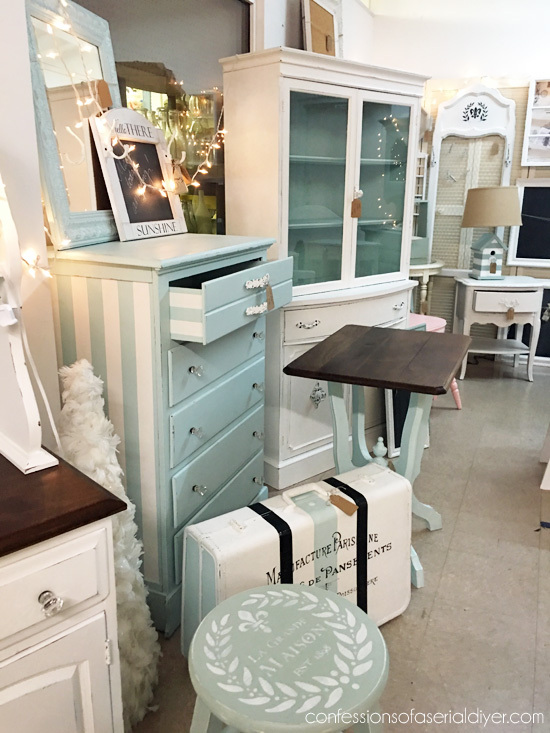 I now want to tackle a dresser and matching chair for my bedroom. Thanks for sharing your wonderful work. Can’t wait to see your next project! You go girl! Those look FABULOUS…I would not be able to part with them. Beautifully done! I have an open back round one I’m debating on doing. I don’t feel very confident about it. Thanks for the tips will definitely be referring back to this when ever I get around to doing it. I am considering painting the fabric because it seems to be fine. I’m ambivalent though because I don’t know what may be lurking underneath. Any suggestions? Great job Christie. 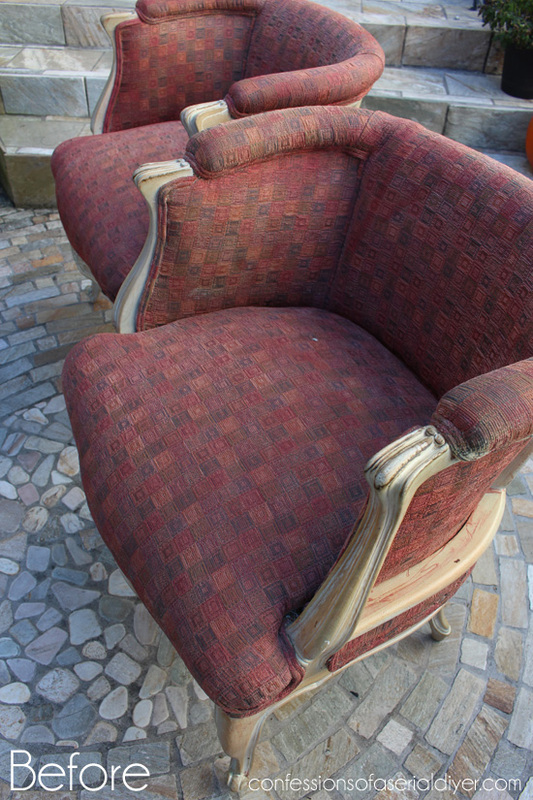 I have two Bergere chairs that need new fahric plus the facbric I chose was RED (can you believe it? )… anyway, I would love to re-do them just like you did yours, can you provide me step by step instructions. I know it would be hard and challenging but I really need to get these chairs redone; they are in the family room off the ktichen and i LOVE them so replacing them is not something I want to do. I can provide pictures so you can see what they look like now, their condition. Any help you and advise you can share would be greatly apprecited. OMG Christy, you never seem to amaze me! Love this chair. You are so talented!!!!! It is beautiful! Thanks, Serena! Yes, the thought of having one more to go was awful. I tried to do them side by side the whole way or once I finished with one, I would have said forget it! Ha ha! You are so talented. I am light years away from doing what you did to those chairs. They are beautiful. Great job! Please send me step by step how you did this. Beautiful job, Christy! I know these were way more work than you anticipated but the end result is so worth all of those hard hours. I’ll bet these will sell very quickly in your booth! Fantastic makeover! I probably would have passed on these seeing the original pictures. But you have a great eye and envisioned something completely amazing! You have totally inspired me to no end! Never underestimate a piece. I’d love to know the entire process of the project! They are gorgeous. And what a great price…wow!! 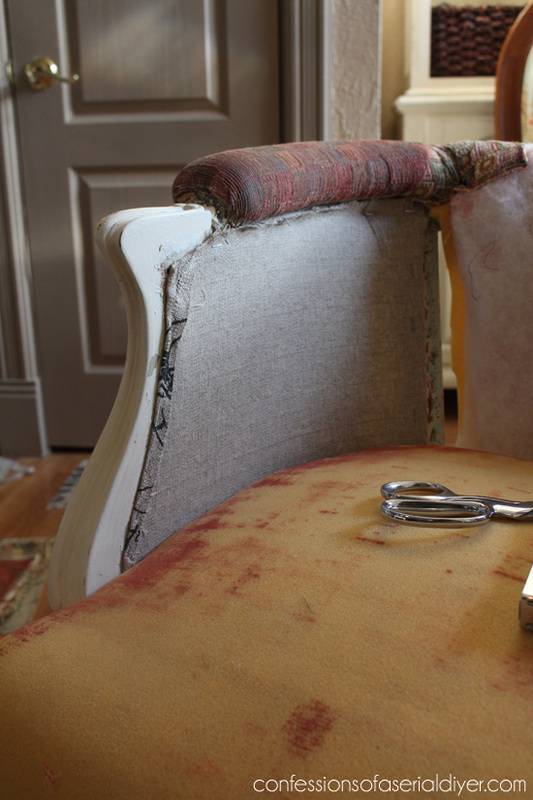 So far my only foray into upholstering has been replacing the fabric seat on my nan’s antique commode chair that’s then one year old ripped to pieces – but it was fun – an air powered staple gun is a fun thing to use! 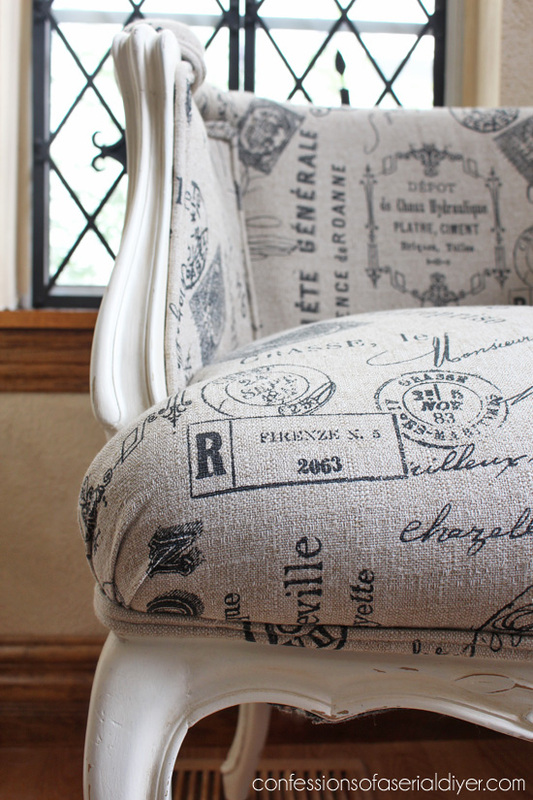 I’m waiting to find the right chair to upholster for a comfy reading nook in my lounge – so I’d love a tutorial. These are absolutely gorgeous, Christy! Too bad you can’t keep them but I”m sure someone will love them and grab them quickly!! One of my favorite makeovers I’ve seen! omg,,,I am beyond impressed. I have tackled smaller chairs and couldn’t even imagine doing something like this. It looks like a professional job that would probably cost 400-500 per chair! I love them. could you add a link to MRL on this post? I am beyond impressed! I cannot imagine parting with these ever, ever, ever! Make the kid and the cat wear gloves! 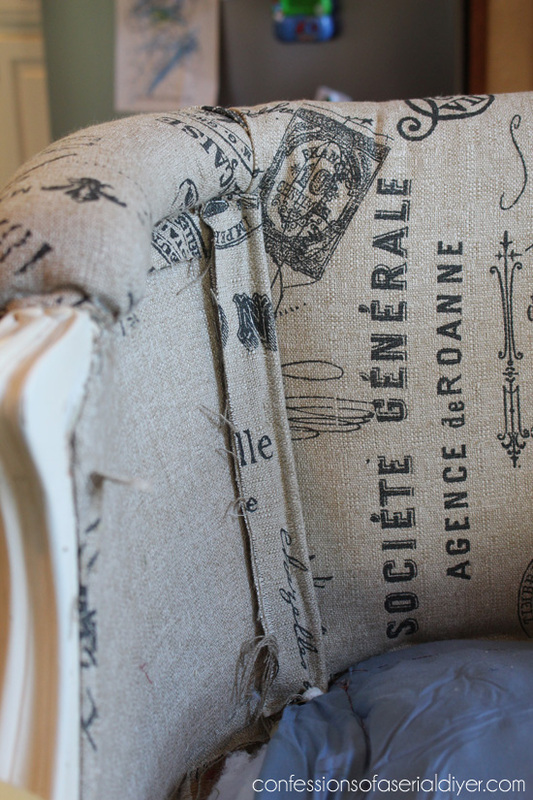 I have never met a French chair I didn’t like, and these are right up top. Hahaha you made me laugh with those action photos! I can see it was all worth it. the chairs look amazing! 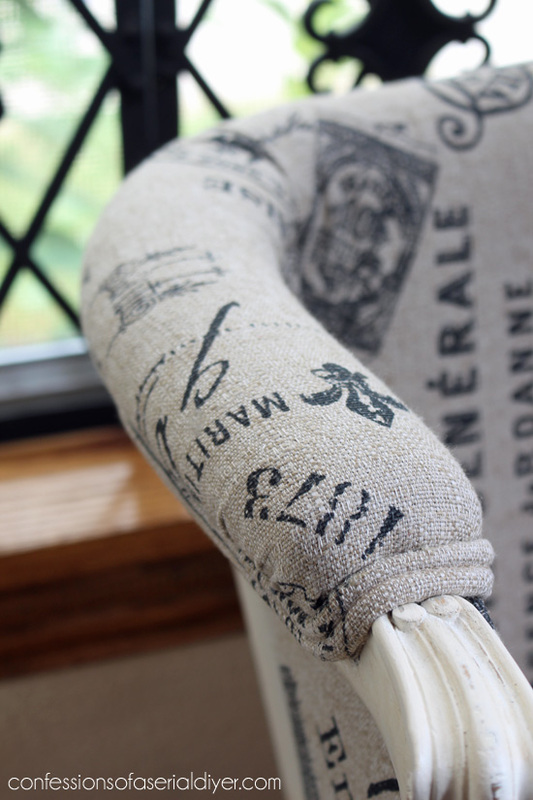 I have a couple of wingback chairs that I need to re-upholster, you’ve given me great tips to tackle them! Great job as always Christy! Love them….do you every sell to out of state? I live in FLORIDA and in the slow process of redoing my living room, and those would look great. I too love the way you pictured them! Wow! Amazing transformation! I would never have had your patience. These chairs are fabulous! I love all of your pieces. You are a huge inspiration to me…thank you for sharing your talent! Oh my, they are beautiful. Your pictures conveyed the pathos and humor everyone who pulls out staples experiences. It’s a dirty, thankless job — but your chairs are gorgeously transformed. They look splendid in the spot you chose, despite your kitty and Cheetos-eating child. work into this project and it shows. Beautiful job. 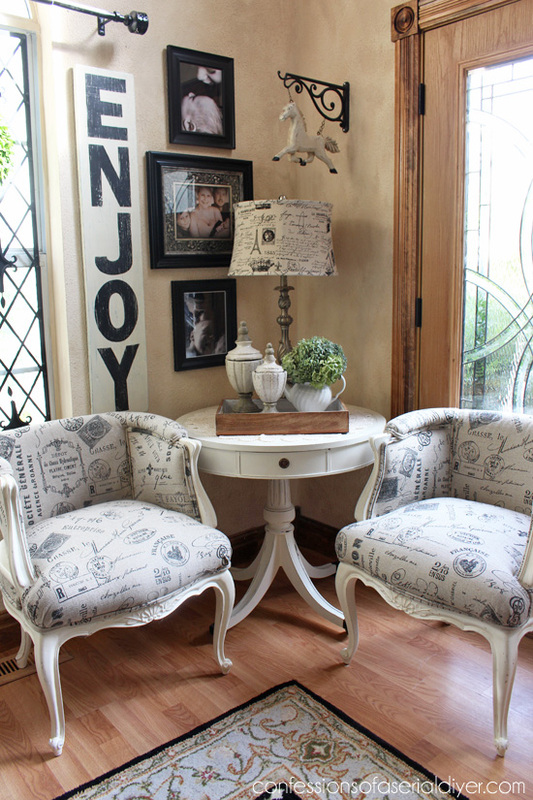 I love, love, love the chairs… Great job! Yes, please send or post the pictures/tutorial of how to complete these chairs. They are beautiful, love the fabric, love the look! And you’re selling them?!!! I sure will. They actually sold this weekend. I just didn’t have the perfect spot for them, but it was sad to see them go! I absolutely love these!! They are so beautiful! I love your fabric choice too! Thanks for sharing. Wow – these are gorgeous! Please do post the tutorial on how to do this. I want to recover a couple of chairs and this ins inspiration to do so. Christy, I loved these so much that I featured them as a Friday Favorite. I hope you stop by to see how I bragged about you. Fantastic chairs. You did a wonderfull job. Do you know I can buy the same fabric in a webshop? Because I love this fabric so much and MUST have it. I´m living in Spain. So glad you like them, Hester! I found the fabric at Hancock Fabrics. If you go to their website, there are two fabrics listed under drapery fabrics that look like it, but I’m not certain which one it is because the background of the sample that matches the price and width of this fabric, looks much lighter. If you are able to contact a Hancock Fabrics store, this is the sku# you would need to order it: 3669926. Hope this helps! I LOVE these chairs they turned out beautiful! Absolutely stunning job. 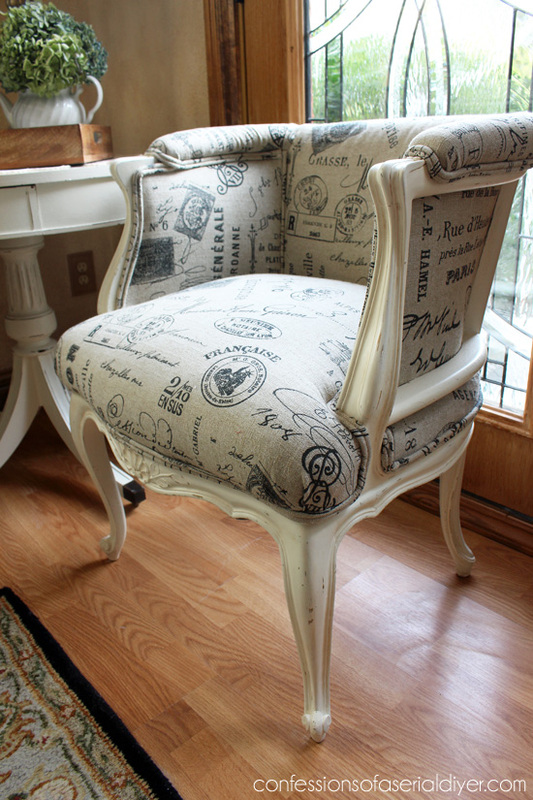 I’ve been wanting to do one of these or a cane back chair but really don’t know how. Do you think what you completed can be done without a sewing machine?? I noticed you made your own welting. I suppose I could buy something that matches. I wish you had a little more detailed photos showing how you did the panels though!!! I would like to know the steps that you did for recovering the chair. I have a French Provincial couch that I would like to recover myself. You did an awesome job on the chairs! Really sweet. I know this is an older post, but where did you find the fabric? Thanks. Thanks for the reply for where you purchased the fabric! Those are two of the prettiest chairs that I have ever seen. I have a friend that found us some chairs from a remodel for 5 dollars each. Woohoo! Bring them on. Ok, I got 4. Hey need some more? They are free! OMG my favorite word. Lets see how many armed chairs that you can squeeze into a Tahoe. Hmmmm, 8? Wait, I see a space, here are 2 bistro chairs…Beverlyhillbillies eat your heart out. THEN, I started to deconstruct. All I could hear was Blake Shelton’s song “What was I thinking”. I have 2 painted on stripped down to the wood. Your chair gives me hope that I can get them finished, I Love your fabric. What sized cording did you use? I bought black gimp trim to use on black and white damask, painted the chairs black. Thanks! This is absolutely incredible! I have one of these old chairs laying around. I might try this out. Your tip about taking pictures the whole way will be very helpful. Oh my goodness, I NEVER would have guessed this was a DIY job. What a gorgeous and unique design. I love this chair, completely to die for. Keep up the amazing work! Pouvez-vous me dire l’adresse où vous avez acheté votre tissu ? Love, Love, Love this project. I purchased two wing chairs at a thrift store for $15 each and need to reupholster them for a luxe modern living room. Please send me your step by step instructions thanks. Thanks, Nelly! 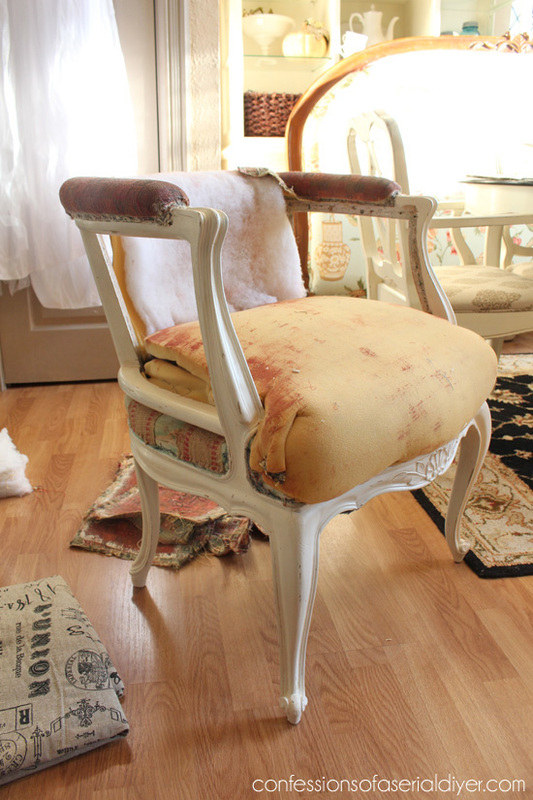 I included a link to the step-by-step instructions at the bottom of that post, but here it is for quick reference: http://www.confessionsofaserialdiyer.com/upholstering-a-french-provincial-chair/ Good luck! Oh my goodness! Do you have patience or what? 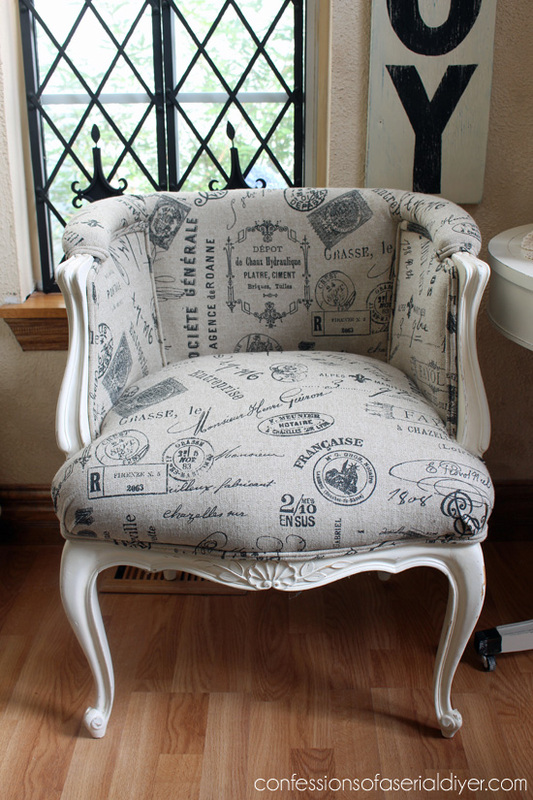 I have a Louis XVI chair with similar complex upholstery that needs to be redone but I can’t imagine doing it myself. Wish I had your perseverance and courage! These are beautiful. They look amazing! Thanks for the detailed instructions! These chairs are some of the prettiest I have ever seen, great job! Can I ask the paint color of the trim we see a glimpse of in the picture where all the fabric pieces are laid out on the floor. This is exactly what I want for my kitchen cabinets. Thanks! Thanks, Teresa! That color of paint was actually an oops paint we bought years ago and no longer have unfortunately. We have since painted the doors, cabinets, and trim Cottage White by Behr. Sorry I’m no help!